I would like to thank Susan of the The Wimpy Vegetarian for tagging me for the writing process tour. Susan's focus is mainly on vegetarian food and her life with Carnivorous Maximas her husband. Her blog is wonderfully written and you feel like you are right at home in her kitchen chatting over a cup of coffee or tea. When Susan first nominated me as one of three people for the Writing Process Blog Tour I hesitated. Why the hesitation? At first I was not quite sure myself. Maybe part of it was that I was going to have to take time and sit down and really think about what I am really doing. Am I going down the right path? What is it I am trying to accomplish? I started my blog in 2010 but never really told anyone, including family or friends. I never commented on other sites, I was very private. It was a long time coming but I have come out of my shell if you will. In January of this year I changed all that and decided to live out loud, so here I am. Currently I am on the Oregon coast using veggies from my garden and local farmers markets to create new recipes. Additionally I am trying my hand at sprouting and fermenting. Also constantly working on better photography, finding the right light is much harder than it looks. 2.) How does my work differ from others of it genre? My work does not differ from that of many other food blogs. I like to incorporate my recipes into our daily activities, which usually is gardening and hiking. I enjoy writing about my life in food in Phoenix Arizona where I spend most of my time and then summers on the coast in Oregon. The two regions are so completely different from each other but I try to focus on what is healthy and in season. It all started as a way to connect with others that shared the same type of food and interests that I did. I have found the blogging community to be supportive and helpful in so many ways. This has helped me tremendously along this part of my journey. Also food seems to go hand in hand with people you care about and special occasions in creating stories and memories to be treasured. It all starts with an ingredient or recipe that I have seen on-line, at a restaurant, friend's house etc. I research it, think about it and then start gathering the ingredients if necessary. I jot down on paper my ideas and then go from there. Sometimes my ideas go as far as the folder on my desk, while others make there way into my kitchen. I have found that mornings are usually the best time for me to write. There is something about the quiet and having a space completely to my self. Scrummy Lane: Helen currently lives in Perth Australia and before that Greece. On her blog she states she is working her way back to the U.K. her original home. 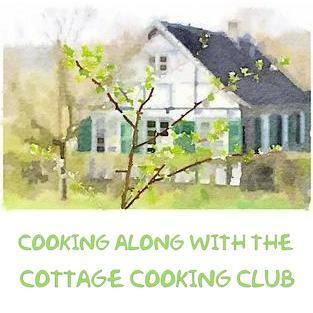 Many of her recipes are fresh and seasonal and revolve around her everyday life and travels that are narrated by her witty humor. Always a great recipe and story. Simply Fresh Dinners: Robyn lives in the Pacific Northwest on Vancouver Island and loves finding new ways to create dishes with fresh ingredients. Many are low in calories and all are delicious. I look forward to her Tuesday's Tidbits as she features other blogs and links to interesting things around the internet. Always as great read. Hi June, great minds think alike! Rally enjoyed reading about you and so good to know more about you. I am very glad you came out of your shell and decided to share with all of us. I really do enjoy your blog and your recipes and photography are fantastic. Thank you Suzanne, thank you for the wonderful comment and support, really appreciate it. Great to get to know more about you Cheri. Well done! I've been blogging almost 4 years and nobody at work knew about it until recently. Now only a few discuss it with me. Some of us need to reach out - so glad you did. Have a wonderful week! Hi Tricia, I totally get what you are talking, I think for some of us it just takes a little more time. You are so talented and such a great baker, don't forget that. Really nice to get to know more about you Cheri. Well done! I too hesitated before telling anyone about my little hobby. I still don't promote myself like I should. Have a wonderful week! Hi David, never thought about it like that but really it is very similar, thanks for being so supportive. Interesting! Great to learn more about you. Thanks Rosa, appreciate you stopping by. Hi Karen, thanks for the wonderful comment, so thoughtful. Nice, Cheri. Thanks for sharing! Hi Tandy, appreciate your comment, thanks! 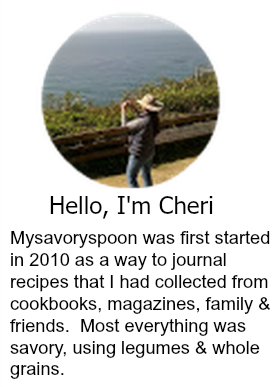 Awesome Cheri, it's great to know a lil bit more about you and your writing process. Hi Mike, thanks for the wonderful comment! Nice to learn more about you, Cheri! I also originally intended on keeping my blog mostly to myself, but I have a huge mouth and couldn't shut up about it (still can't, I'm probably a really annoying person to talk to, ha). Hi Kelly, so glad you didn't, I absolutely love your blog and have referred a few family members and friends looking for great healthy recipes. I loved this post, Cheri. As I've mentioned, visiting your blog feels like coming to your kitchen for a cup of tea. Such a lovely feeling here. Thanks so much for your kind words! I'm looking forward to writing as well. Hi Robyn, can't wait to read your post, thanks for the wonderful comment. HI Kylee, thanks for your nice comment! Hi Pat, wow! your doing really well for blogging less than a year. Congratulations! I loved reading more about your process!! It's always so fun to compare and hear how other bloggers come up with the things they do! Thanks Joanne, it is fun to see the differences. Hi, Cheri. Well, of course I thoroughly enjoyed reading this, especially as I'm next! I totally understand the fact that you've been a bit of a 'slow starter' as far as being a part of the blogging community goes. Believe it or not, I felt a bit 'shy' about it all at first (and still do to a certain extent), and actually surprised myself a bit when I said yes to taking part in this 'writing process tour'. Until now I have always said no to similar things! Hi Helen, oh! oh! can't wait to see what you write as you are always so clever, appreciate the comment. Nice to see you also doing the blogging tour process. I'm like you, I like to research ingredients. Blogging is great for meeting friends, and learning. Thanks, google, right? It's nice to hear how you get your inspiration. Hi Angela, blogging is a great way to meet others, everyone is so supportive. Hi Susan, yes I agree, I have meet so many supportive people as well and it is hard to stop, you can spend all day blogging and commenting, I've had to put a time limit on it. Glad to hear that you're finally making it "public" :) You are doing a great job, in my opinion! Thanks Julie, you are so sweet! Thanks Kelly appreciate your comment. I loved reading about your writing process! I've been traveling and am horribly behind. I'm sitting in a hotel room right now, in fact, catching up on my favorite blogs :-) I'm so glad you decided to participate. It's a fun and worthy process to sit and think about what we're doing and why. Food blogging takes up more time than non-bloggers can ever guess. Thanks so much for sharing. The photo you chose for the post is PERFECT!